Campsite Le Plein Air de Chenes is part of the Sandaya chain of campsites that lies within a lovely 8 hectare woodland just to the north of Montpellier. 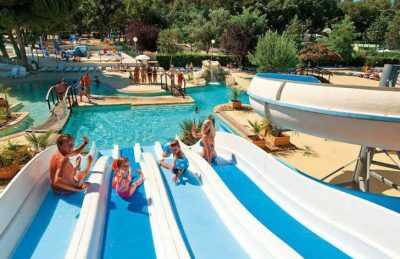 This fantastic 4 star quality campsite is situated in a beautiful area offering the benefits of being on the outskirts of all the action without having the hustle and bustle that you find in some resorts in the South of France. Located between the land and the sea means that you have the freedom to explore some of the wonderful natural sights whilst still being close enough to make the most of the seaside resorts and beaches. The centre of Montpellier lies a little under 6 km away and offers everything that you could possibly want, from its rich culture, history and gastronomy to its pleasant shops, bars and attractions. For those that crave the beach, you can find a fantastic example at Carnon-Plage which lies just 17km away. During summer months the campsite also puts on a free shuttle bus service to the beach to ensure your holiday is as relaxed as possible. The beach is long, sandy and perfect for families of all ages whether you plan to sunbathe, swim, build sandcastles or have fun. The swimming pool complex at Campsite Le Plein Air de Chenes is truly outstanding. Covering an area exceeding 1200m2, you’ll find a lagoon styled pool, additional swimming pools and children’s pool, splash water jet area for younger children, waterfalls, river, several fantastic slides and of course lots of sunbathing areas. It’s a fantastic aquatic area which will leave you wanting for nothing. Campsite Le Plein Air de Chenes offers a comprehensive range of activities and facilities on site to ensure you have a fantastic family holiday. On site activities at Campsite Le Plein Air de Chenes include a multi sports area, football, basketball, boules, tennis, mini golf, table tennis, fitness area and playground. Facilities available at Campsite Le Plein Air de Chenes include WIFI, restaurant, snack bar, takeaway, bar, groceries, animation team, games room, tv room, washers and dryers. Accommodation at Campsite Le Plein Air de Chenes includes a range of 2 and 3 bedroom mobile homes that are available from Suncamp.